A PROUD Scottish Gran was determined not to miss out on her granddaughter’s big day – despite being almost 5,000 miles away. 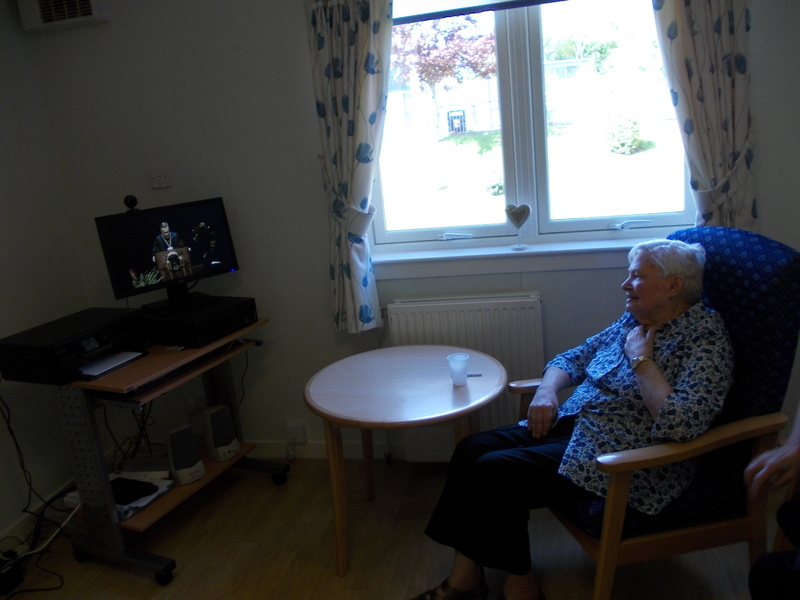 Thanks to tech savvy staff at Bield’s Coxton Gardens in Glasgow, Sheila was able to see Lara in her cap and gown via a live stream over the internet. Shelia invited other tenants to join her in witnessing the momentous occasion as it happened in Texas 4,624 miles away. Shelia, who has been a tenant at Coxton Gardens, a very sheltered housing development, for five months, said: “I am very grateful to Bield for organising it. “It made me so happy to watch Lara graduate as she was so many miles away. “At my age, not knowing how technology really works, it was a real treat to be able to watch the ceremony. “Some of the other tenants watched it with me and we all had a great afternoon. Sheila’s son, Gary, left Glasgow and moved to Texas with the rest of his family, 14 years ago. Sheila has been out to visit her family in Texas four times including on her 80th Birthday. But when it became apparent his mother may miss on Lara’s big day, Gary contacted staff at Coxton Gardens to see if anyone could help. Josephine MacLennan, the Senior Housing Care Assistant at Coxton Gardens, saved the day by setting up a link to a live stream at the University of Texas. She then arranged the viewing in the communal area of the development. Josephine said: “It was lovely to get involved to help Sheila watch her granddaughter graduate. “It’s the first time we have done something like this but it is most definitely something we would do again – technology allows us to do amazing things now. “We have another tenant whose daughter lives in Australia and she skypes regularly with her iPad, but she is able to do that on her own and we aren’t really involved. “We set up some posters and put out an announcement to let other tenants know what was happening and a few of them joined Mrs Christie to watch. “As a new tenant, we thought this could be a great way to help her meet people and socialise. Lara graduated with a degree in Business from the Austin McCombs School of Business of the University of Texas.